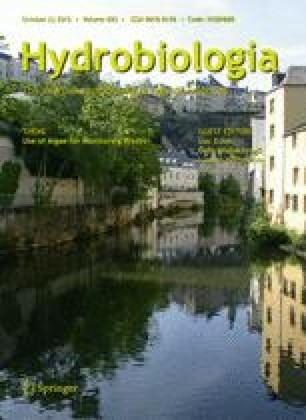 There is increasing interest in the restoration of urban river systems because they are affected by multiple point- and diffuse-source impairments. In South Wales, these issues are exemplified by the rivers Taff and Ely, which have a well-documented history of pollution. We developed a network of river-monitoring sites to capture as many sources of impairment as possible and to provide an integrated assessment of basin-wide conditions using established, recently revised and new methods to assess ecological status as required by the Water Framework Directive (WFD). Most of the 34 river sites, except those in upstream areas, had moderate or poor ecological status and low species richness. There were significant correlations between the UK Trophic Diatom Index (TDI), phosphate and nitrate concentrations, but the strongest correlation was with sodium concentrations. Sodium also differentiated best between ecological status classes. The UK TDI, Ecological Quality Ratios and the Indice de Polluosensibilité Spécifique (IPS) correlated strongly, but the IPS reflected chemical conditions less well. There were also possible metal impacts including some upstream sites despite apparently good or high ecological status. These data reveal strong capacity in diatoms for reflecting stressors that affect urban river networks. We recommend (i) further assessments including geographically comprehensive and repeated surveys to underpin local decision-making and (ii) further refinement of the tools currently in use for WFD purposes through the development of specific diagnostic indices or multi-metric methods for a comprehensive assessment of complex catchments affected by multiple impairments. We would like to thank Gary Jones, Department of Mineralogy, Natural History Museum, London, for part of the chemical analyses, and Martyn Kelly and two anonymous reviewers for their helpful comments on the manuscript. Ellis, J. & V. Adriaenssens, 2006. Uncertainty estimation for monitoring results by the WFD biological classification tools. WFD Report GEHO1006BLOR_E_P. Environment Agency, Bristol. http://publications.environment-agency.gov.uk/PDF/GEHO1006BLOR-E-E.pdf. Accessed 2 Apr 2011. Environment Agency, 2008. A consultation on the Draft River Basin Management Plan, Severn River Basin District. http://www.environment-agency.gov.uk/static/documents/Research/06_Severn_RBMP_Consultation_main_document.pdf. Accessed 2 Apr 2011. Kelly, M. G., S. Juggins, H. Bennion, A. Burgess, M. Yallop, H. Hirst, L. King, B. J. Jamieson, R. Guthrie & B. Rippey, 2007. Use of diatoms for evaluating ecological status in UK freshwaters. Science Report: SC030103. Environment Agency, Bristol. http://www.wfduk.org/LibraryPublicDocs/diatoms_sc030103. Accessed 28 Mar 2011.